Investing in real estate is part of the American dream. It means that you have move beyond being a renter, or simply a homeowner, and have graduated to landlord. However, being a landlord is not all milk and honey. If you want to make real money by owning investment properties, then you need to follow what the pros do. 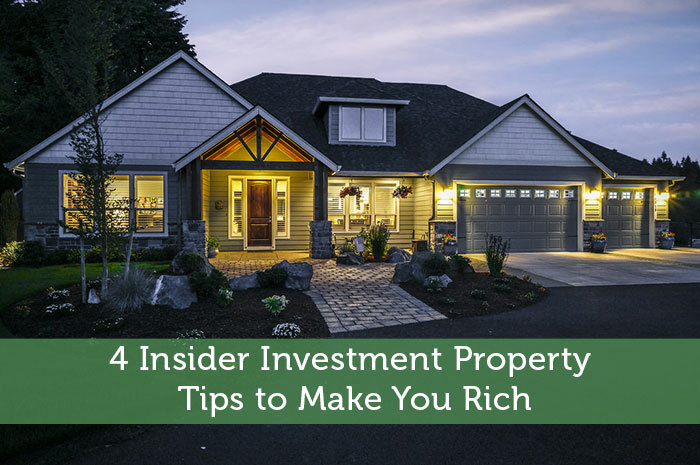 With that in mind, here are found insider investment property tips to make you rich. If you are a real estate investor, then you know that property is one of the best investment vehicles on the planet. But you also know that owning piece of dirt is not enough. The real value is when you can transform that piece of dirt into a money-making machine. This is what many of the richest families in the country have done and it is the best way to build what some insiders have called a ‘four-generation wealth strategy.’ For example, investment properties in Atlanta, or near where you live, which benefit your children but if managed right, your children’s, children’s children. Investment is all about generating returns, but if the cash flow on an investment property is upside down then it will be very hard to justify the money spent. In fact, investment in properties which do not flow correctly is the single biggest reason why property investors fail. Let me explain why cash flow is important. Imagine you had one property, which you rented for $1,500 per month and the costs on that property were $1,000. This means you would generate $500 in profit every month – well almost every as we need to account for vacancies. Ok, that $500 will buy a nice dinner, but it will hardly make you rich. You are correct, but imagine you had 50 or 100 units generating $500 per month in profit. That would mean your portfolio would be generating anywhere from $300,000 to $600,000 a year in cash. This when it starts to get exciting. The insider secret is to start with properties which can generate regular profits. These properties may not be the most glamorous, but they will generate the cash you need to accumulate additional properties and this is how you will build your real estate empire. Now this has become more difficult as the market returns to pre-crash levels. But insiders know that the best way to make money is to buy low and sell high – this is what Warren Buffet does. It starts by looking for properties which will appreciate quickly. This way they can bank the gains and then roll them into a bigger and better property, or they can cash out completely and spend the rest of their days on a yacht. Some of the challenges with appreciation is that it does not always work in a straight line. Sometimes asset prices move up, sometimes they move down, and other times they are flat. In addition, it can be difficult to manage emotions by not getting caught up in an over-exuberant market. This is what happen to many investors in 2007 and 2008 as they believed that the market would keep going up. Remember what goes up, DOES come down and you don’t want to get stuck holding the bag when it happens. This brings us to the second insider tip, look for value and then don’t hold onto the property too long. Interest from loans is good for the banks and bad for the landlord. Yes, money has a cost, but if you can, you should try to pay off your loans early as this will free up money which can be deployed for other uses. This does not mean you want to pay all cash for a property. While that saves you the interest payment, it ties up your cash. As such, look to strike a balance. Use bank loans to acquire properties but then try to pay off the loan as early as possible. This can be done by adding an extra five or 10 percent the interest payment every month. Before you know it, you will have taken years of the life of the loan. Another thing that insiders do well is that they minimize their taxes at the local, state, and federal government levels. This does not mean that they cheat on their taxes. Instead, they look for opportunities to maximize deductions thereby saving hundreds, if not thousands, of dollars in taxes every year. A word to the wise. Don’t try to do this by yourself. Hire an accountant who knows real estate taxes and make sure you have a clear audit trail in place. This way you can minimize your taxes without worrying about penalties down the road. I do think that if you are considering getting an investment property or properties and you don’t have any experience with such things that research is important. Talk to those that may already have investment properties, talk to a lawyer, a financial advisor, etc. Great information, thanks for sharing! I like your advice to have a tax strategy. I think that a lot of people don’t understand the possibility of earning more money by taking care of their finances beforehand when it comes to your property. Do you have any other tips about getting a real estate property? Do you have any advice about finding the right real estate person to assist you?